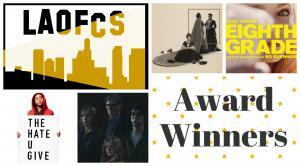 LOS ANGELES, CA, USA, December 7, 2018 /EINPresswire.com/ -- The Los Angeles Online Film Critics Society is pleased to announce the winners of their 2nd Annual LAOFCS Awards. Fox’s The Hate U Give leads this year’s winners with a total of four awards including Best Picture and Best Adapted Screenplay. Bo Burnham’s Eighth Grade will take home Best Independent Film, Best First Feature, and Best Performance by an Actress 23 and Under for Elsie Fisher. Spike Lee’s BlacKklansman wins Best Male Director while Lynne Ramsay’s You Were Never Really Here wins Best Female Director. Netflix and Alfonso Cuarón’s Roma cleaned up the Best Foreign Film category as well as Best Cinematography. The Los Angeles Online Film Critics Society was founded in late 2016. Its purpose is to be a critics group that is diverse and supports underrepresented voices. The Los Angeles Online Film Critics Society goal is to have a year-round presence. The members of the LAOFCS participate in a weekly Movie Pick of the Week as well as themed monthly project for the Daily Critic Pick. In addition, the organization has a weekly show on the Popcorn Talk Network called LAOFCS Weekly where different members of the organization discuss various new and older films as well as things currently being talked about in the film world. Brie Larson and John Cho to Receive Honorary Awards at the 2nd Annual LAOFCS Awards Ceremony on January 9, 2019.